Follow the steps below to purchase a USSA Short Term Membership. If you have any questions regarding USSA membership see the Membership FAQs below or click the Live Support link to talk with a Membership Representative. Create a My USSA account or log in to your existing account. A My USSA account allows you to manage your membership(s) along with providing access to numerous other benefits. To create a My USSA account click the "Create a My USSA account" button below. Your My USSA account is absolutely FREE. Later you will use your My USSA account to link it with your member record. If you have already created a My USSA account, please log in now. If you have forgotten your My USSA username or password click here. 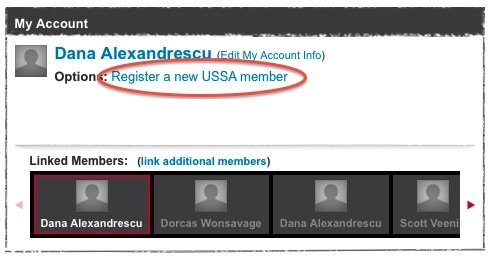 In the "My Account" box on your My USSA page click the link labeled "Register a new USSA member". You will be redirected to the online Membership application. You may purchase a new USSA membership for yourself or for someone else (i.e. a parent who needs to register a new USSA membership for their child).